"Over the years we have had the opportunity to develop a working relationship with Kevin as we seemed to cross paths at many music festivals around the world. 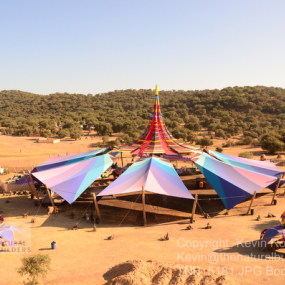 In addition to that Kevin was always an integral part of one of the design, creation and development of one of our naturally built main stages at our music festival Lightning in a Bottle. In short working with Kevin has always been a positive and productive experience over the years." "Kevin Rowell and The Natural Builders have worked on several different projects for us to our complete satisfaction. All projects were done in a timely manner. Problems were addressed in an intelligent and creative way. The window job was huge; our house is a craftsman cottage, about 100 years old. Some of the windows were rotting, all of them had shifted out of square. The Natural Builders plugged away at this job until it was completed. The kitchen pass-through is beautiful, opens up the house, and The Natural Builders came up with creative recycling solutions which look fabulous. The roof on our home, unbeknownst to us, had been structurally unsound. Kevin reconstructed our roof, ripping it down to the beams, plywooding it to create a much safer roof and foundation for the roofing. Kevin Rowell is great with people, a very good communicator, professional, trustworthy and very safety conscious. We highly recommend him." "To whom it may concern, I was greatly assisted in every way at the Boom festival to create an amazing install under impossible conditions. My efforts and many others made possible with the help of Kevin Rowell. I highly recommend him to do the impossible. Your success is one decision away." "I'm happy to recommend Kevin Rowell for the position of Build Director at your festival. Others may have similar skill sets or experience but what sets Kevin well apart from the rest is his matchless energy and heartfelt desire to meet any goals and overcome obstacles. When you ask yourself "who's got my back?"... well, more than likely, it'll be him!" "He tenido la oportunidad de hacer prácticas profesionales con The Natural Builders, para Boom Festival 2012 y otros proyectos. Kevin definitivamente es una persona que sabe como dirigir y organizar grupos de trabajo especialmente bajo presión. Es un buen líder, que sabe tratar a las personas (clientes, voluntarios,etc) terminando el trabajo en el tiempo requerido, sin contratiempos. Es un buen amigo el cual me ha ayudado y compartido su experiencia y conocimientos acerca del bambú y su construcción." "I did an internship with The Natural Builders, to Boom Festival 2012 and other projects. Kevin definitely is a person that knows how to organize large groups, specially under pressure. He is a good leader, and knows how to treat people (clients, volunteers, etc) always finishing on time with the best solution! He is a good friend that has helped me and shared his knowledge about bamboo and construction!"